Have you ever been annoyed by short distant runners, lapping you on your 30 km training run and thinking themselves to be better than you? Now there is a means to put their insignificant achievements into proper perspective: the Marathon Display! 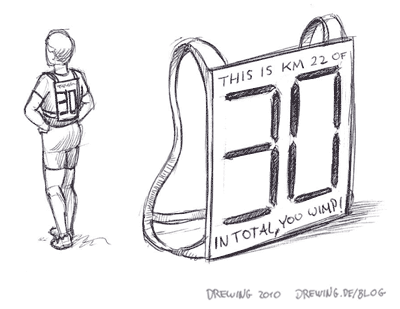 It’a a light weight display connected to your GPS tracker (via Bluetooth) that shows your currently elapsed kilometers and – most important – the complete length of your training unit. You know short distant runners are ridiculous – let them feel it and buy the Marathon Display, right now!